A woman is like a single flower. She does not need to be a bouquet to add beauty in our lives. 'Stri Sarjanatmakta : Ek Yatra' was organized by 'Spandan Sanstha' on Friday in an attempt to honor women who have achieved heights in their respective fields, marking the celebrations of Women's day which is celebrated on 8 March every year. The event was held in Swaraj Bhawan, Bhopal. 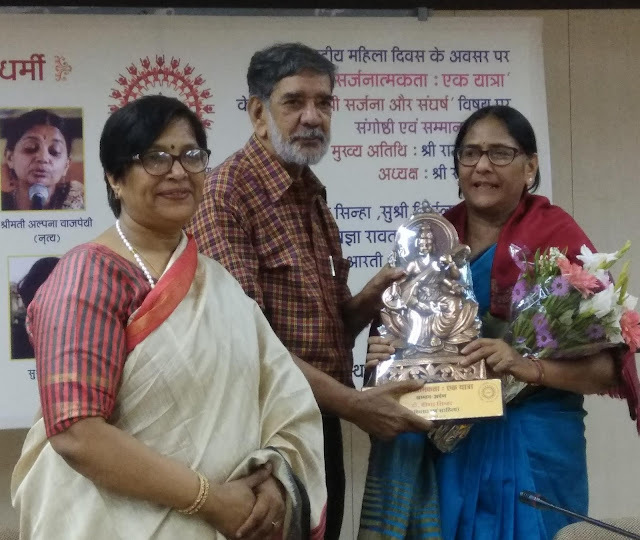 Rajesh Joshi, noted writer and poet was the chief guest , organized under the chairmanship of Santosh Chaubey and convened by the convener of the organization Urmila Shirish. "This event, which honors the talent and ability of a woman who contributes to the creation of new and creative approaches in every field. This series, which started in the year 2018, will come in new ways in the future with further expansion." said Urmila Shirish. The event was divided into two sections first, where women who are related to literatur recited their compositions and the other half included honouring women who have achieved accolades in different walks of life. Suman Singh, Dr. Arti, Dr. Savita Bhargav, Dr. Veena Sinha recited their poems and Rekha Kastvar read her story. The magazine 'Stri Sarjanatmakta : Ek Yatra' was also launched by its editor Urmila Shirish. The awardees were then felicitated by the Chief Guest Rajesh Joshi. The awardees include Savita Vajpayee (Politician), Dr. Papiya Dasgupta (Theatre artiste), Alpana Vajpayee (Dancer), Dr. Veena Sinha (Doctor & Laureate), Dr. Savita Bhrgav (Poet), Shampa Shah (Sculpturer) and Dr. Arti (Journalist). The felicitated women also interacted with the audience sharing experiences and stories regarding their field. Let's know more about the women who were felicitated. Savita was felicitated for her work in the politics and social service. Also earlier in her career she worked in the fields of journalism. She has M.A. and L.L.B. degrees. In 1957 she became member of Samajwadi Party, organization secretary of Socialist party in 1975, in 1977 she was chosen as member of legislative assembly from Sehore, and then became cabinet minister of higher education. And in 1980 she became regional general secretary of Janta Party and after she became member of Janta Dal. She was honored for her contribution in the field of theatre. From writing scripts of the plays to act in theatre shows and also in radio drama shows. She is highly educated, she has done M.A. in Geography and Phd in the same field, she is a retired professor and head of the department of geography at Sarojini Naidu Govt. Girls P.G. Autonomous College, Bhopal. She is proficient in Hindi, Urdu, Bengali and English languages. Her book 'Paryatan: Ek Adhyayan' has been published by Hindi Granth academy, Madhya Pradesh. 'Prevalent Hardship and Poetry in a National Park: A Case Study' research paper published in the book- human rights and Poverty in India. Recently she has written 104 episodes of radio script and a full length stage play on Swami Vivekanand. A project of Swaraj Sansthan, Bhopal, Madhya Pradesh. She is a well-known Kathak dancer of Raigarh Gharana. She is trained in the traditional 'Guru-Shishya' style in Chakradhar Nirtya Kendra, Bhopal by genius of Raigarh Gharana Pt. Kartikram and his son Pt. Ramlal. She has performed in many cities of India and also in the abroad like Moscow (Russia), Brussels (Belgium), Normandy (France) and Sharajah (U.A.E.) etc. She also performed in the Khajuraho Dance Festivsal in 1993, 1999, 2010 and 2016. In 1997 she was chosen to be one the fifty dancers to perform as part of Swaran Samahroh on the occasion of 50th Independence Day by the government of India. she has won numerous awards including Kala Manishi award in 2003 and Nritya Kala Award in 2018. Now is Varishth Guru of Chakradhar Nritya Kendra, Ustad Alauddin Khan Sangeet Evam Kala Academy, Govt. of Madhya Pradesh, Bhopal. She teaches Raigarh Gharana Kathak to her students in there Guru Shishya Parampara. She is a well known Gynecologist and is working for Hindi literature since 4 decades. Her compositions have been published in most prestigious newspapers and magazines. Her stories are usually related to women, social and cultural which conveys the reality of the society in a heart touching manner. Her novel 'Pathpragya' which has a background of historical and cultural has been awarded with Arya Smriti Sahitya Samman and Akhil Bhatiya Divya Puruskar. The other novel 'Sapnon Se Bahar' that is based on social complexities and present scenarios in medical systems has been awarded with Vagishri Puruskar. Her poetry collections are 'Tumhe Jana Hai Maine' Subah Ki Dhup Fir Bhi Jeena Ladki' and to 'Kabhi Tootta Nahi Swabhibor'. 'Subah Ki Dhup' is awarded for its spiritual and serious poetic sense. And 'To Kabhi Tootta Nahi Swabhibor' was awarded by Madhya Pradesh Sahitya academy. Her English poetry collection has also been published, one as 'Unless The Perfect Rhythm Sets In' and 'Glow In The Mirror'. At present she is Directorate of Health Services, Satpuda Bhavan, Bhopal. She has done D.litt in Hindi literature and also worked in cinema and theatre. She also does critical writing and has written a criticism book on Shamsher 'Kaviyon Ke Kavi Shamsher'. Her poetry collection 'Kiska Hai Asman' and 'Apne Aakash Me' has also been published. She has also been awarded with Vibha Mishr Smriti samman. Currently, she is working in Sarojini Naidu Govt. Girls P.G. Autonomous College Bhopal. She is an artist, writer and a curator. In 1987-90 she learnt ceramics under Daroz at Bharat Bhavan. Then she did her masters in botany with specialization in Forest Ecology, in 1989. Also a diploma in Museology from Bhopal University in 1992 and masters in sociology with specialization in cultural Anthropology in 2001 from Bhopal University. Her art has been exhibited nationally and internationally. She has been awarded with Best Potter of the year Award by All India Fine Arts and Crafts 1989, 1992, 1994 and highly recommended award for sculpture - 7th Bharat Bhavan biennial of contemporary Indian Arts Bharat Bhavan, Bhopal 2017. She has edited numerous texts and catalogues related to tribal art. And also her numerous essays have been published. She has translated a novel 'The Storyteller' by Peruvian author Mario Vargas Llosa (Nobel Prize Winner of 2011) into Hindi which is published as Kissago by Rajkamal Prakashan, New Delhi. She is M.A. and PhD in Hindi Literature. She is active in media from 10 years. She is editor of the magazine 'Samay Ke Sakhi' that has been in existence from last 8 years. Also, she has edited the book 'Naresh Saxena Ka Vyaktitva Aur Krititva'. Her poetry collection 'Mayalok Se Bahar' has been published. Currently she is working with Ravindranath Tagore University.